Oreo balls recipe, scaled down. Finally! It has happened to me–I’ve been at a cookie exchange party where no one brought the Oreo balls. It’s a little bit like Thanksgiving without pumpkin pie. It’s hard to get through, but it is possible to survive. I’ve never tried to make the Oreo balls recipe until this year. I enjoy them each year at holiday parties, and bakers tell me just how dang easy they are, but I usually just nod and move along to the next cookie. I’m a little bit in shock that the Oreo balls recipe is really just 3 ingredients, and couldn’t be simpler to make. Maybe I avoided them because if I made the recipe, I would have 40+ Oreo balls in my house. That is not safe, do you know what I mean? I cut the recipe in half, and used 20 Oreos and half the amount of cream cheese typically required. The math works out to about the same number of Oreo balls as number of Oreos you use, so you are very welcome to scale down this recipe further. 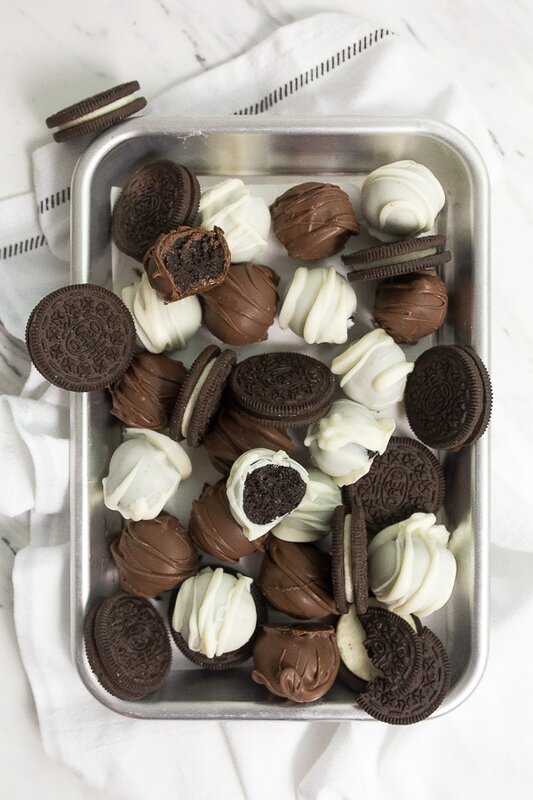 The next time I have an ounce or two of leftover cream cheese from making small batch cinnamon rolls or my cheesecake for two, I will make another small batch of Oreo balls. os in the package, these are great to make! Plus, I also have cookies and cream cupcakes, and Oreo brownies, if you really need help using up those cookies. 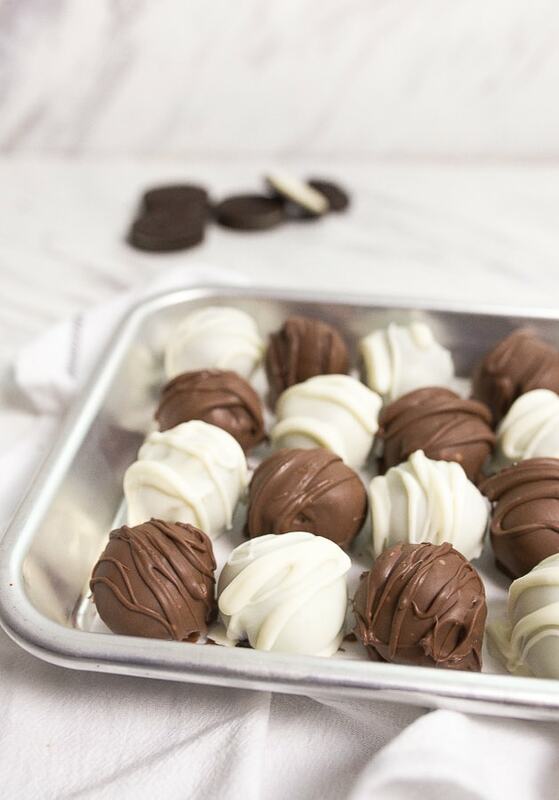 These cookie truffles are essentially just smashed Oreos mixed with cream cheese, rolled in balls and dunked in chocolate. Mash the Oreo cookies! The fastest way to smash the Oreos is to use a food processor, but if you’re baking with kids, I highly recommend placing the cookies in a resealable bag and letting their little hands crush the cookies. Yes, you are crushing the entire cookie, cream centers and all! Place the cookie crumbs in a bowl, and add the softened cream cheese. 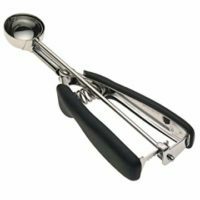 I like to do this in a stand mixer with the paddle attachment, but a hand mixer or regular wooden spoon works well, too. If the cream cheese isn’t soft or nearly room temperature, it will be too hard to incorporate it. Roll the mixture into small balls. I use this small cookie scoop to ensure they’re all the same size. Freeze the balls after rolling. I repeat: you must freeze the balls for at least an hour before rolling. Melt the chocolate for dipping. I use almond bark candy coating, because I love the taste of it. It’s what I grew up on, and while I know it’s not exactly real white chocolate, I love it all the same. Plus, it makes a nice thin coating. I take any of the leftover melted chocolate and drizzle it back on top of the truffles after they’ve cooled. That’s how I get the pretty striped pattern you see in the pictures. 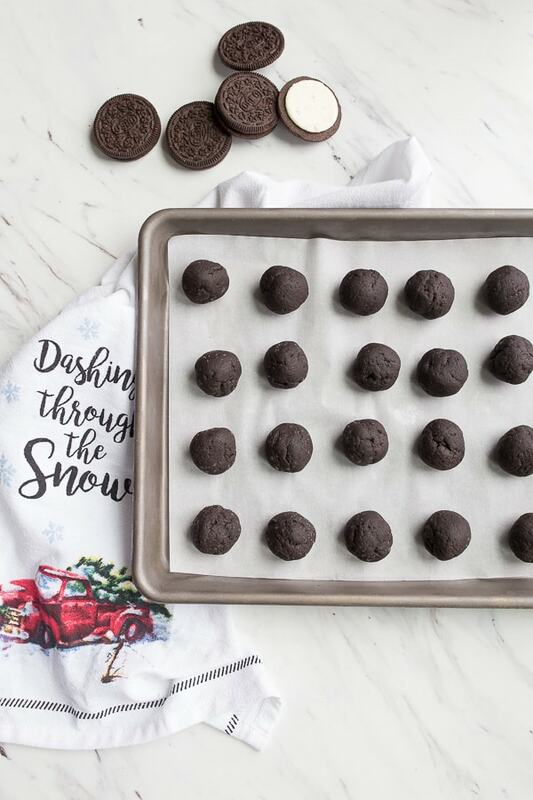 I’m glad you and I have a way to make ourselves a small batch of Oreo balls just in case we encounter a holiday party where they aren’t served. Let me know if you double the recipe or scale it down even further! 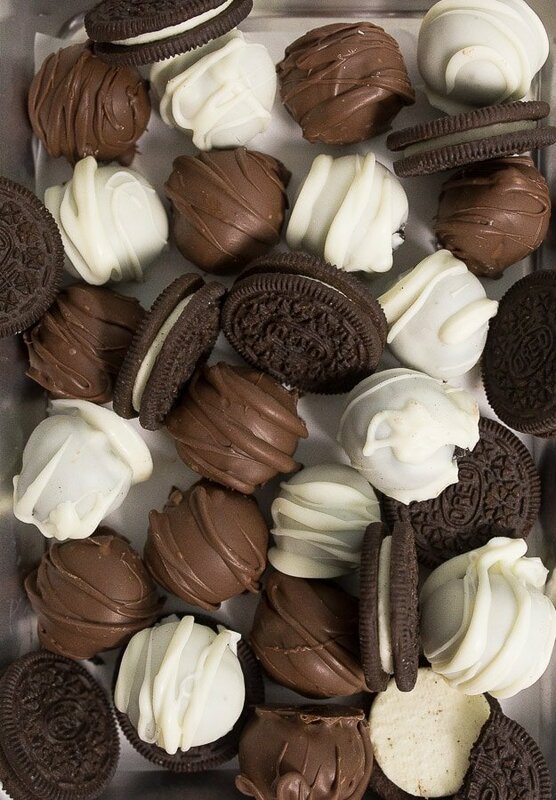 A small batch of Oreo balls. In a food processor, crush the cookies until they're completely pulverized. If you're not using a food processor, you can crush them by hand in a resealable plastic bag. Place the cookie crumbs in a bowl of a stand mixer with the paddle attachment, and beat the cream cheese into the mixture. You can also do this by hand, just make sure the cream cheese is very soft. Use a cookie scoop to scoop out evenly sized pieces of the batter, and roll in your hands to form perfect ball shapes. Place on a parchment-lined baking sheet, and freeze for one hour. Divide the white chocolate candy pieces into 2 bowls, and melt them in the microwave according to the package directions. To one of the bowls, stir in the mini chocolate chips; stir until melted. Try not to put the chocolate chips in the microwave--they don't love the microwave heat and might seize. The white chocolate should be hot enough to melt the mini chips. If you're not using mini chocolate chips, chop the chocolate very small. 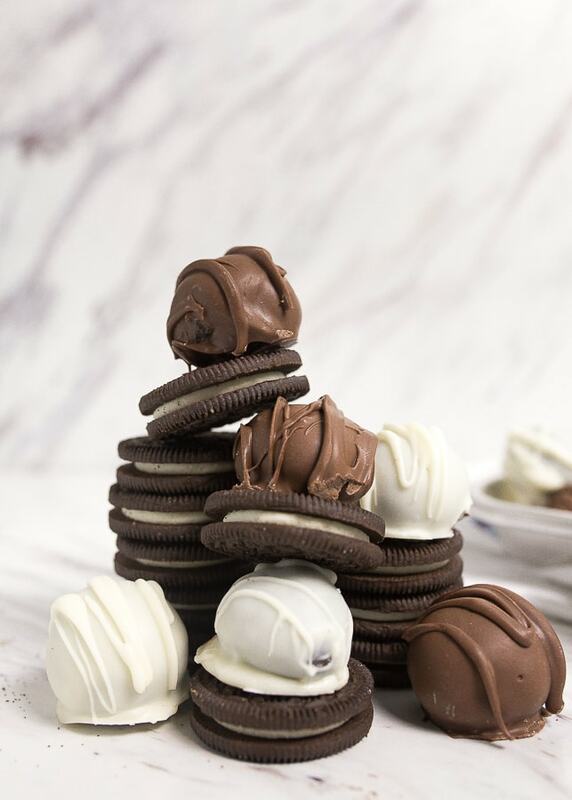 Using a fork, dunk each Oreo ball into the chocolate. I like to make half white chocolate and half regular chocolate. How do you keep the chocolate coating melted. I tried to make with Nestle semi sweet chips and it kept getting to thick to coat. Finally added a little butter and milk. Are you following the recipe and using the candy coating? It’s not the same as chocolate chips. It’s often called ‘almond bark’ or ‘CandiQuick’ or ‘candy coating.’ Real chocolate chips are too thick to coat a truffle. I’m sorry! So funny! I once did something similar to this with one of those Special Edition Oreo flavours that end up in the pantry after halloween. I came up with the idea of making “truflles” and I did exactly what you described! crushed the cookies and mixed them with cream chees. then made the balls and covered each ball with very very thinly crushed oreo covers. Meaning that I removed the cream just to get the black cookie powder. they resulted amazing!! no need to add sugar or any other sweetenner. I love the idea of coving them with chocolate, so cool!! Just made these with red velvet oreos and can’t wait to see what people think at my work Christmas party tomorrow. Thank you! 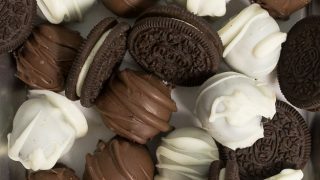 Going to make these this weekend using Lemon Oreo’s dipped in White Chocolate. Hi! I have double stuffed Oreo’s, should I adjust the amount of Oreo’s used? I’m thinking about making these to add to the dessert table at my wedding. Can these be made ahead of time? How should they be stored and how much in advance do you think I could make them?